The outrage over Hollywood's practice of replacing Asian characters with white actors is striking a chord. On Tuesday, the hashtag #WhitewashedOut was trending throughout the day, as people shared their thoughts on the "erasure" of Asian Americans from "whitewashed" movies and how that trickles down to society at large. And it elicited a response from Scott Derrickson, the director behind "Doctor Strange," one of the films that Asians are reacting to. Marvel says the movie is based on Doctor Strange, a comic character who first appeared in 1963. Tilda Swinton, an Oscar-winning British actress, is playing the Ancient One, who in the Marvel comic book is a Tibetan male character. The film will be released in November. "Raw anger/hurt from Asian-Americans over Hollywood whitewashing, stereotyping & erasure of Asians in cinema. I am listening and learning," Derrickson tweeted on Wednesday. C. Robert Cargill, writer on the Marvel film, said during a podcast last month that the Chinese government could have been alienated had the film depicted a Tibetan. Cargill later clarified on Twitter that he was speaking for himself, not Marvel. He then told the New York Times that he had no role in casting decisions. For its part, Marvel has said that Swinton's character is Celtic in the film. "The Ancient One is a title that is not exclusively held by any one character, but rather a moniker passed down through time," Marvel said in a statement. The company defended its record on diversity and said it "regularly departs from stereotypes and source material." Vocal dissenters about the casting choice include Star Trek actor George Takei. "There has been a longstanding practice of taking roles that were originally Asian and rewriting them for white actors to play, leaving Asians invisible on the screen and underemployed as actors," Takei wrote on Facebook. "This is a very real problem, not an abstract one. It is not about political correctness, it is about correcting systemic exclusion." @scottderrickson The criticism is very valid. Your listening is appreciated, but take the next opportunity to do right. Thanks. 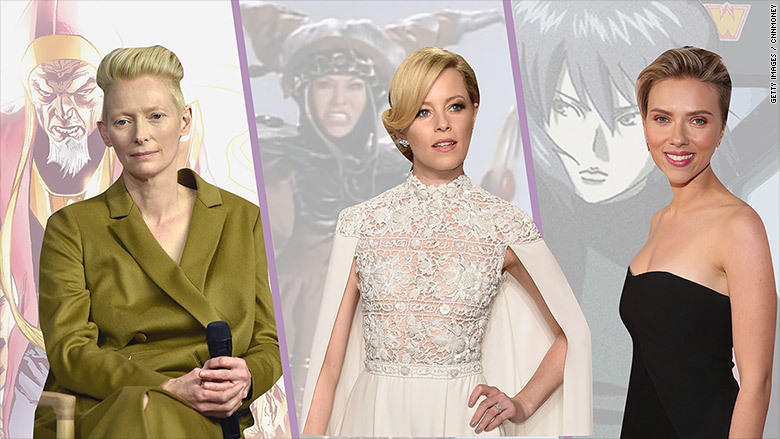 Other recent examples include Elizabeth Banks playing Rita Repulsa in the Power Rangers movie, out in 2017. (Repulsa was an Asian character in the 1990s TV show.) And Scarlett Johansson was cast in a film version of "Ghost in the Shell," which was originally a Japanese graphic novel. It's due out in 2017. The hashtag #WhitewashedOUT was started by comedian and actress Margaret Cho, writer Ellen Oh, and The Nerds of Color. "We want Hollywood studios, producers, and casting directors to stop casting white people in Asian roles -- or any roles that should be filled by people of color," they said in a blog post. They launched the hashtag on Tuesday afternoon in honor of Asian Pacific American Heritage Month. "We're tired of Hollywood acting as though Asian Americans don't exist, and want to let them know that we aren't watching these whitewashed movies," they wrote in a blog post announcing the movement. They will pick up the conversation again next Tuesday. The responses that have rolled in so far provide a powerful look at how Asians felt growing up with primarily white characters in the media. #whitewashedOUT means being told as a kid "you talk like a white person" and feeling guilty for being glad of it. Being #whitewashedOUT means I was called a "chink" and "chinaman" by age 6. I felt only other API would accept me. Users took to Twitter to plea for change in the industry. Being #whitewashedOUT is having white people get the credit for telling (terrible) versions of your stories while yours are ignored. It's not just a recent problem -- the trend dates back decades. 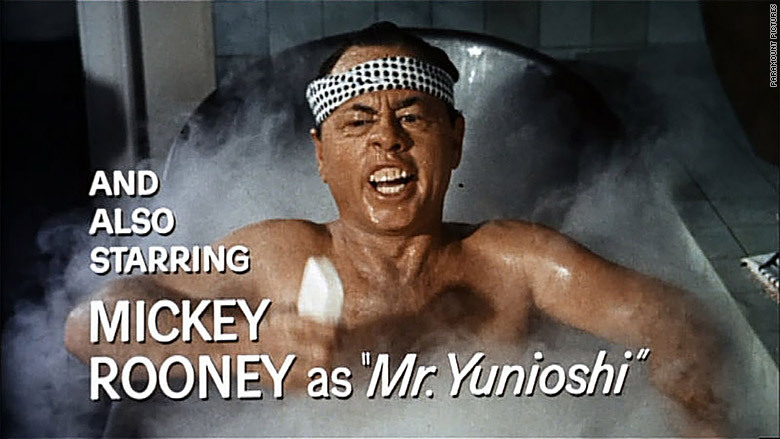 Remember Holly Golightly's Japanese neighbor, Mr. Yunioshi, played by Mickey Rooney in 1961's Breakfast at Tiffany's? Dear white people, #whitewashedOUT isn't about attacking you. It's about calling out system of ongoing racism that existed for a long time! The conversation around race extends to skin tone, as well. The casting of Zoe Saldana to play Nina Simone, a lighter skinned Afro-Latina actress was the subject of scrutiny. Earlier this year, the Academy of Motion Picture Arts and Sciences said it hoped to double its number of diverse members by 2020. The announcement came after the outrage that for the second straight year, no people of color were nominated in major acting categories. A study released in February found Hollywood to be a "straight white boys club" both on and off the screen. It found that too few African Americans and non-white actors have more than token roles -- and there are also few LGBT characters in film. Correction: An earlier version of this article incorrectly described Marvel's position on the casting of the movie. CNNMoney's Hannah Bae contributed to this report.